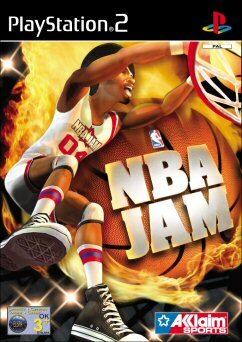 It's been a little while but welcome back to the world of NBA Jam. Before you cringe I am pleased to tell you that after the debacle of the last time a Jam title was on the shelf, they have fixed a lot of problems and overall this is a much more polished title. 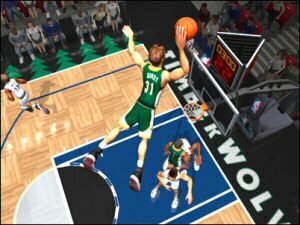 There have been a number of changes made to the game and one of those is that the title is now three on three and you can expect gameplay to have the same sort of flow that titles like NBA Street gave you. The games mixes it up with a roster of past and present stars so you have a large selection of ballers to choose from. 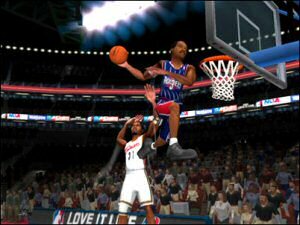 Jam focuses on the extreme rather than the strict game of ball and personally I like this approach, though truth be told, we've done it in NBA Street Vols 1 and 2 now, and in some cases even done it better. One thing I did like better with Jam was how easy it was to get straight into the game and start showing off skills. There are only a small number of combos to press to achieve some brilliant moves and floor the opposition and they look good in their execution too. Graphically the game looks a bit simplistic in comparison to the impressive representations in the EA games, the players in this title all looked a bit cartoony to me, albeit accurate in their depiction of the player. Courts look good and there are some effects used such as light's reflected on the playing surface that are nice. Nothing new but nice. Animations are smooth and everything runs very well in the game, although the way that some players actually move does look odd. One of the sweetest things that I saw in this title was when you play in Legends mode. The game runs in black and white! As you progress, you eventually get to play again in colour. This was a brilliant innovation and one that I had not seen done before, it's stuff like this that helps the game be a little bit more than just another basketball game crowding the shelves. 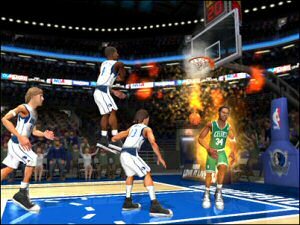 Playing well with a player also has it's rewards in NBA Jam if he can make three hoops in a row that will fill all your players statistics and basically makes you all super players. This effect lasts till you put another five shots home or the other side manages to put one through. You are pretty much invincible when you are on fire and would have had to screw up badly for the other team to take possession. of the other team. The quality of the calls themselves are nice and clear though, just whatever triggers the call is a fraction too late and the recording too slow to adapt to changes in gameplay. Audio for the title is very appropriate as far as music selection goes as well with era specific tracks to keep you entertained whilst playing. There are so many things to unlock in this game it is staggering and it's nice to see a title that is trying to actively keeps it's purchaser playing. Be warned you do have to earn Jam points to see any of the extra magic and it takes ages to build up a high enough score to do this. This is a good comeback for this franchise, but I think that we need a touch more polish before getting too excited. Simplistic controls may annoy some ball freaks when all you need to win is good timing to keep that ball dunking happening. That's almost a relief when you take into account the fact that your team's AI leaves a bit to be desired, and doesn't really take care of business by itself which should be the case. Instead you are stuck with madly shuffling through the team manually as you cannot trust them to do what's right. The style of gameplay is rough and ready so be sure that you are right to do the same thing back to the opposition. The title does vary a bit when in multiplayer so I would suggest getting this one out to play with a friend, otherwise it's almost a case of trading buckets with the AI and the last one scoring wins. My advice: Rent, Try and Buy.